Storch, David; Marquet, Pablo A.; Brown, J.H. We know that there are tens of millions of plant and animal species, but we do not know enough to be able to describe the patterns and processes that characterise the distribution of species in space, time and taxonomic groups. Given that in practical terms it is impossible to expect to be able to document biodiversity with any degree of completeness other approaches must be used. 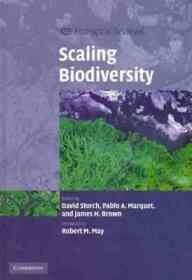 Scaling rules offer one possible framework, and this book offers a synthesis of the ways in which scaling theory can be applied to the analysis of biodiversity. Scaling Biodiversity presents new views on quantitative patterns of the biological diversity on earth and the processes responsible for them. Written by a team of leading experts in ecology who present their most recent and innovative views, readers will be provided with what is the state of art in current ecology and biodiversity science.